Hola! I’m back in California now, missing San Miguel de Allende, Mexico. Here I am with my new best friends at an art gallery extravaganza for the Day of the Dead. Alas, we’re all a little worn out. If you’ve seen the Disney movie, Coco, you’ll have a good idea of the Day of the Dead festival. In San Miguel de Allende, I was very fortunate to be invited to stay with an old friend in her sister’s elegant home. There’s nothing like a live performance of Mozart’s last work, Requiem, to make me feel holiness all around. 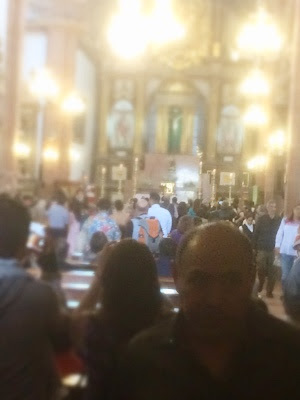 I took this photo as I sat enthralled in the packed La Parroquia Cathedral in Centro, the center of town, on the night of The Day of the Dead. What a feeling of communion and comfort I experienced with a diverse, appreciative crowd. A few days later I had a book reading nearby at Garrison & Garrison Books that took place in a charming courtyard. I was surprised to have my audience’s rapt attention as I pointed out details from my Southwest Anasazi books, Spiral and Sundagger.net, with characters whose ancestors clearly would have come from Mexico. Wherever I could, I included actual Southwest artifacts that I’d learned of in my research. For example, in Spiral, Little Hawk, savors a small jar of chocolate that a park guide told me about during my 2015 trip to Chaco Canyon, New Mexico. The chocolate shows that Southwest Pre-Puebloans knew of, and traded, with ancient pre-hispanic Mexico as cocoa plants do not grow in the American Southwest. My last day in Mexico I went on a day tour of ancient pyramid ruins with Albert Coffee, an expert tour guide in the region’s archeology, who spoke of recent findings of human and dog skeletons, a severed head carried hundreds of miles for final interment, and even a young elite, female warrior, all buried in the pyramid complex of Canada de la Virgen (Canyon of the Virgin). The name refers to a geode rock discovered at the site during excavation that broke, revealing an image of the Virgin Mary. It’s thought there are other pyramids inside this visible one. That day my big accomplishment was to climb the tiered pyramid of the Canyon of the Virgin, just recently excavated. I made it all the way to the top! The rocks were huge and uneven, of sparking limestone. The pyramid itself was built to match the paths of the sun and moon across the sky, much in the same way as the Anasazi aligned their Great Houses in Chaco Canyon, New Mexico. Waiting by an iron bull sculpture for the tour van to pick me up. I wonder if I’ll ever find words to describe my enchantment with “The Heart of Mexico”, as San Miguel de Allende is called. If only I could sing like this bird I saw as I was walking along the path of a botanical garden in the hills outside the city. 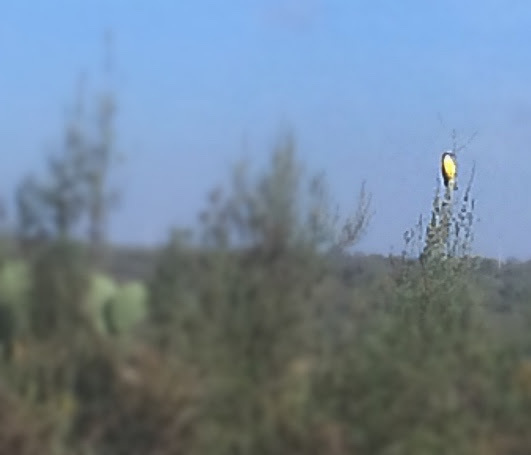 —Yellow headed blackbird in the Charco del Ingenio Botanical Garden. Take a breath. Imagine the deep, quiet, heartbeat of stillness. Breathe in that feeling of Peace.